Life good? Domestic bliss, financial security, kids at university, wife getting plastic surgery, beer shop opened next door .......? But you know underneath, that sometimes you have to give it an injection of misery to balance it all out. You could do worse that go up Slieve Donard from the Bloody Bridge track and via Crossone. Any one of these three, would sap the life out of you. Together, they can replace all that hope coursing your pink veins, with the blackest of despair. Fk it's awful! Or as a member of the gay, lesbian and whatevernext "Out and About" Club appraised me, it is "awful awful awful" - and he is right. The Bloody Bridge track, named after the bloody bridge the Mourne Heritage Trust has concreted into the mountainside, may be the most dour 60 mins you will ever spend - boggy, featureless, gripless, pointless and to compound everything, imprinted by the dead hand of the MHT. "Go here" "do this" "cross this" etc. So you try to get off it at the first opportunity. 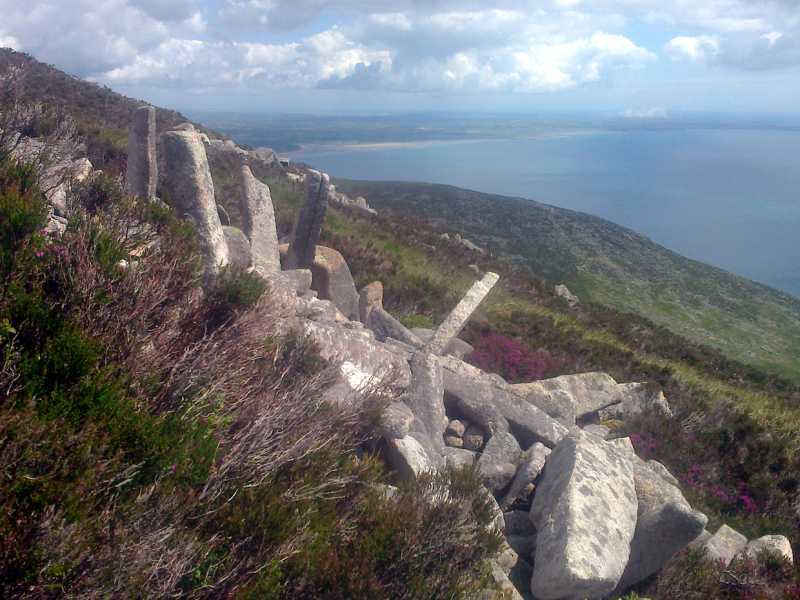 You refuse to hang a left because that is exactly where the MHT wants you to go, so you amble out towards Crossone, Mourne infant at the mighty knee of Slieve Donard. A heather and bog trot nonpareil. Something dark and sinister in its col with Donard. Odd and claustrophobic. Then, like wading through glue, eventually on to the face and summit of dull Donard. You check your watch and it seems to have taken you half the day - so to all your other woes ... disgust, exhaustion, boredom, unease ..., you can now add ....... failure. I shall deny myself the final denouement of discovering that MountainViews doesn't think Crossone is a hill and visit the beer shop next door instead.